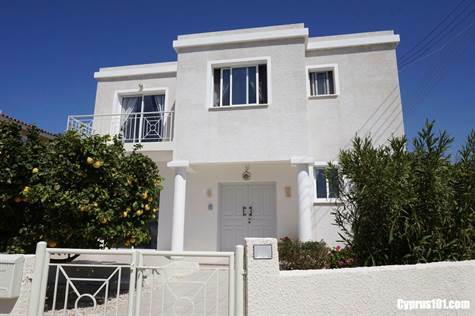 Cyprus Property Blog by Cleo : Kissonerga Detached Villa Walking Distance to all amenities! Kissonerga, Paphos - This spacious 3 bedroom detached villa is situated on a corner plot within easy walking distance to the traditional village of Kissonerga. The village has a good range of amenities such as supermarket, banks, pharmacy, bakery, card shop, bars and restaurants, and the nearest beach is a few minutes away. The property features a large open plan living room with an attractive archway separating the comfortable lounge from the dining area and kitchen. The kitchen is well equipped with built-in oven, electric hob and extractor fan, fridge freezer, and dishwasher. A separate utility room off the kitchen houses the washing machine and provides additional storage space. Off the lounge near the staircase is a guest cloakroom and useful under-stairs storage cupboard. Upstairs there are three good size double bedrooms, all with fitted wardrobes and en-suite facilities. The master bedroom has it’s own private balcony with mountain views, and the second and third bedroom share a second balcony. The outside space has been cleverly designed by the current owners and is ideal for outdoor dining and entertaining. Off the kitchen is a large terrace with pergola and an outdoor kitchen including a built-in barbeque and oven. Stepping down to the pool terrace there is a fitted bar with fridge and plenty of space for relaxing. The gardens are very nicely landscaped with a good selection of colourful shrubs and trees. A number of sheds provide further storage space. Included in the price are white goods, curtains and light fittings, and the furniture is negotiable if required. Title deeds are available.